where is the Fourier transform of , is the wavelength of the light, and are the transverse wavevectors. This integral may be efficiently computed with Fourier transforms, and the general approach is known as Fourier Optics. It may not capture all of the details of a first-principles solution, but certainly suffices for our needs. Left: wavefield of propagating image, Right: isosurface of light intensity, lens indicated by circle. 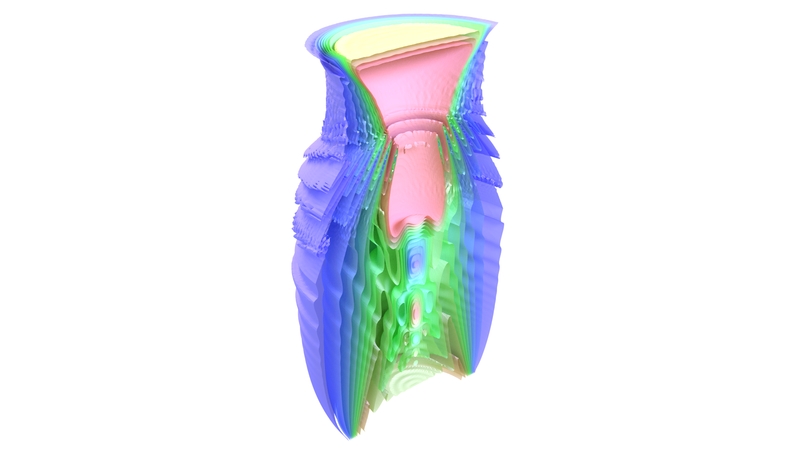 As the wavefield propagates it diffracts, and the image is rapidly distorted to the point where it is unrecognisable. It encounters a lens, 2 focal lengths away from where it started. The light is focussed down, before re-expanding to form an image another 2 focal lengths away. This is known as a 4f imaging system, for obvious reasons. In a laser laboratory (for example) it is used to ‘re-image’ a beam from one place to another. If left to its own devices, a laser will quickly diffract, which ruins the beam quality. The image is a reversed version of the object, and in this special case has unit magnification. Between the lens and the image the light reaches a focus of finite size, whereas in the geometric optics limit the focus would be infinitely sharp. The focal plane can be shown to contain a spatial Fourier transform of the object, and messing with the light in this plane causes funky effects. Constant-intensity isosurfaces of a wavefield propagating from the bottom upwards through a lens. I’ve cut the surfaces in half to better detail their internal structure. I’ve also used a simpler object – just a plain circle. As the beam diffracts we see some interesting near-field structure – local maxima and minima along the optical axis, as the edges of the beam propagates away. As the beam hits the lens and focusses the diffraction is undone, and we see the outer ‘rings’ in the beam travelling back to the centre. 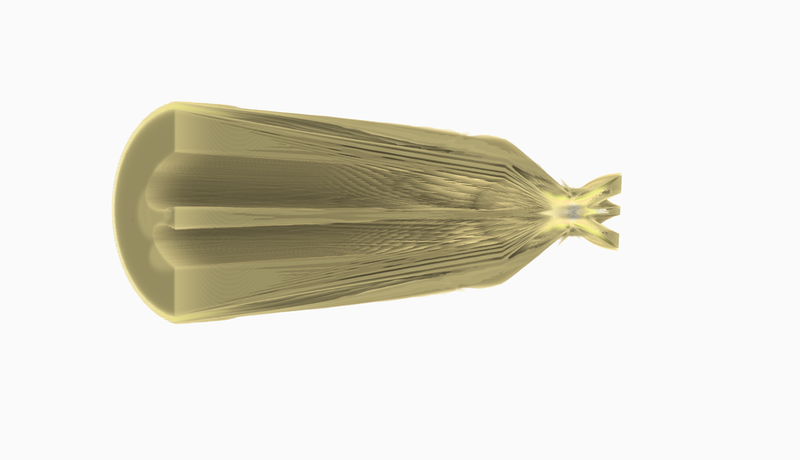 Volume rendering of the light field from the Shepp-Logan phantom object. Now there’s much to be done with the colourmap here, but as a default result it’s quite striking how much detail can be resolved. Isosurfaces rendered using the Blender Cycles renderer. Much better! Making the mesh a little transparent doesn’t hurt the overall look either. 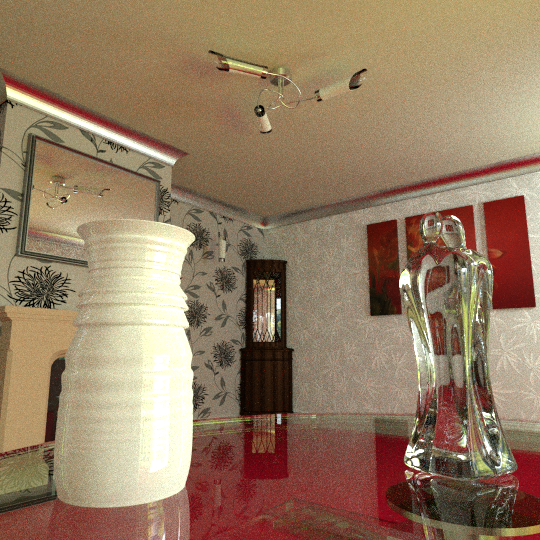 A poorly-sampled render of my dining room with a Fourier vase perched on the table. 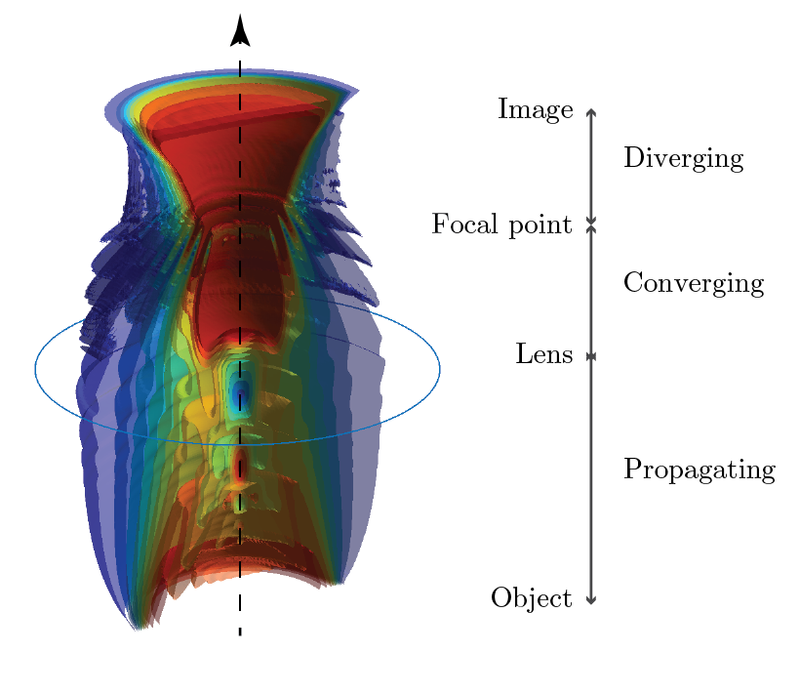 ← How does a lens make an image?